Pebeo's premium Vitrea 160 paints are easy to use. No kiln is needed - you can bake on paint in your own oven. Transform any plain glass into a work of art! Create gorgeous dishware with these lead-free, dishwasher safe paints. Starter Kit created by Delphi's own glass painting experts to make your first project an enjoyable success. A Delphi Exclusive! 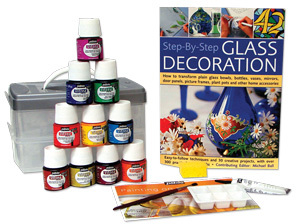 The included instruction book Step-by-Step Glass Decoration will teach you the art of glass painting, etching, stained glass and mosaics through over 300 step-by-step photographs and easy-to-follow instructions. Premium brush and quality paints ensure wonderful results. The full-size 45 ml bottles of paint are enough for many projects, while the paint outliner will allow you to add creative details and designs. All paints are lead-free, food safe and dishwasher safe.